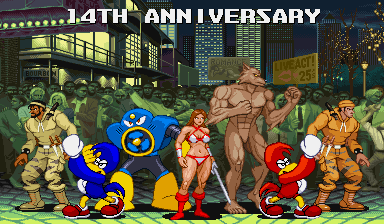 The move has been (thankfully) delayed and I can post a modest 14th anniversary update! – Capcom: Airman from Mega Man 2 added. – Final Fight: El Gado and Hollywood from Final Fight added. – Sega: Werewolf (fight stance) from Altered Beast, Bin and Pin from Dynamite Düx added, new scratch-made Tyris sprite added to Golden Axe. Tips, Tricks & Codes – TMNT Tournament Fighters (SNES) added. – Capcom: new El Gado & Hollywood char (sharing one slot) added, Airman sprites added to “Robot Masters” char slot. – Sega: Dynamite Düx added, Altered Beast char gets new Werewolf sprite. I’ve also started an Illmosis Facebook page, mostly because there are far too many people who’ll only hang out on Facebook. Until a worthy social site successor with better operating practices and less psy-ops experiments on their uses emerges, check out the Facebook page if you’re already a member of that site! The positive note here is interacting with other fansite friends and communities, so at least it’s not completely horrible! Be sure to check out Jeremy Parish’s new site, Metroidvania.com, dedicated to games that use open paths instead of fixed levels. You know, games like the Pitfall series, the non-arcade Bionic Commando games, and (of course) the Metroid and map-based Castlevania games. I’m really looking forward to seeing what this site turns into as I’m a big fan of this game style. 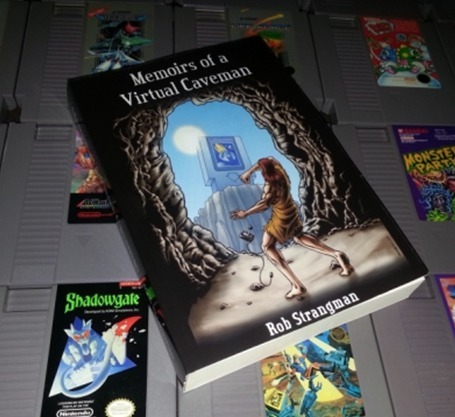 The new edition of Rob “Dire” Strangman’s “Memoirs of a Virtual Caveman” is now available at http://www.memoirsofavirtualcaveman.net! There’s a ton of new content, including contributions and interviews with David Crane (Pitfall! ), Howard Scott Warshaw (Yars’ Revenge, E.T., Raiders of the Lost Ark, Yuzo Koshiro (soundtracks of Streets of Rage, the Revenge of Shinobi, Actraiser), Kouichi “Isuke” Yotsui (director of arcade Strider, Cannon Dancer/Osman), Sushi-X (EGM), Sam Roberts (The Light Sword Cypher Mainframe), Caitlin ‘Cipater’ Oliver (Splatterhouse hi-score record breaker) and so many others that my hands would be tired if I added them all. Just go to the site and see for yourself! BTW: I drew the cover, but don’t let that stop you from buying the book! Due to the upcoming move to a different apartment (much like last year), this anniversary update is small because I needed time to pack. I’ll try to make up for that by having a few bigger updates in August and September, the 8th and 9th months of the year, to give some serious love to the Revenge of 1989 theme. I’ll be in Artist’s Alley at the All-AmeriCon convention in Warren, Oho this Sunday, the same convention that comic creators Darryl Banks and Jim Steranko will be! To celebrate that, I’ve made sprites based on their creations. Kyle Rayner, a character created by Darryl Banks and Ron Marz gets a hovering sprite and Madame Hydra (a.k.a. the Viper) now has a sprite based on the iconic pose from Captain America #111. Kyle also has his first Green Lantern cover logo while Viper has her Eaglemoss figurine logo (does she even have an official comic logo?) and a name graphic for the X-Men: Children of the Atom Vs. Screen. 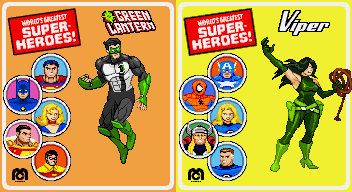 They’ve been added to the proper DC and Marvel sprite galleries along with the GFX Generators. Bad news: Due to history repeating itself again, I’ll have to move to a different apartment sometime this month. The owners have to rip through this apartment to fix something that was messed up in another apartment, so it’s time to move again. I don’t have an exact date yet, but I’m pretty sure it’ll completely screw up the July 19th anniversary update. Yeah, just like last year, too. Keep your fingers crossed. Good news: I’ve set up a page on Illmosis where you can buy prints of some of my pictures. There are only a few game-related prints so far (including the Tyris Flare pic), but there will be more in the future.